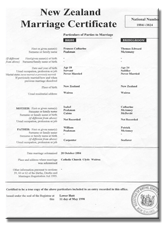 We supply official New Zealand birth, death and marriage certificates at an affordable price with free postal or paid courier delivery by DHL or NZ Courier Post. 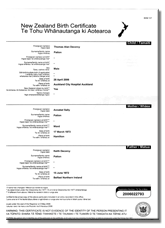 So if you need a replacement copy of a New Zealand certificate, we can have your application lodged safely at Births Deaths and Marriages (NZ) and your certificate dispatched to you by mail or courier usually within a few days. All certificates supplied are full, legal and certified, suitable for passport, visa, pension and welfare benefit applications. Our fast and efficient service is renowned. Births Deaths and Marriages approved us in 2014 and we remain "approved and trusted". Ordering online is easy. We use the security of Paypal to accept Visa, Mastercard credit card payments. Your order will be confirmed by email. 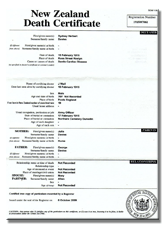 Certificates are usually dispatched using standard postal services within a few days but allow up to 8 working days. For customers overseas, allow sufficient postage time for the certificate to reach you. If you still haven’t received your posted certificate after 21 days from issue, please use our online enquiry form to send us a message. We will respond promptly.